The Xcel Wobbler is a great new product that provides instantaneous coverage over a large area and distributes "rain" like droplets that resist wind drift and evaporation. The Wobbler is used extensively in many areas such as lawns, gardens, nurseries, vegetable crops, turf irrigation, and much more! Its unique off-center rotary-action distributes extremely uniform coverage at low pressures. This product works great for germinating with its minimal impact on soil structure. It is built for strength and durability, using high-impact engineering grade thermoplastics; no metal parts. 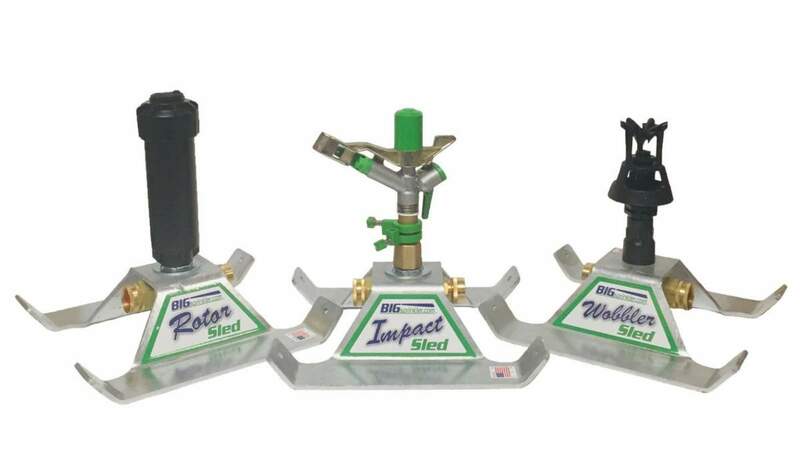 The Wobbler covers up to 50 feet plus in diameter and allows for interchangeable nozzles. This combination includes our 2 lb weighted sled base that is constructed of high-grade thermoplastics and includes an integrated weight for stability. A high-quality solid brass garden hose connection swivel is included. Sled base is designed for flow-through capability for connecting multiple sprinklers in series. 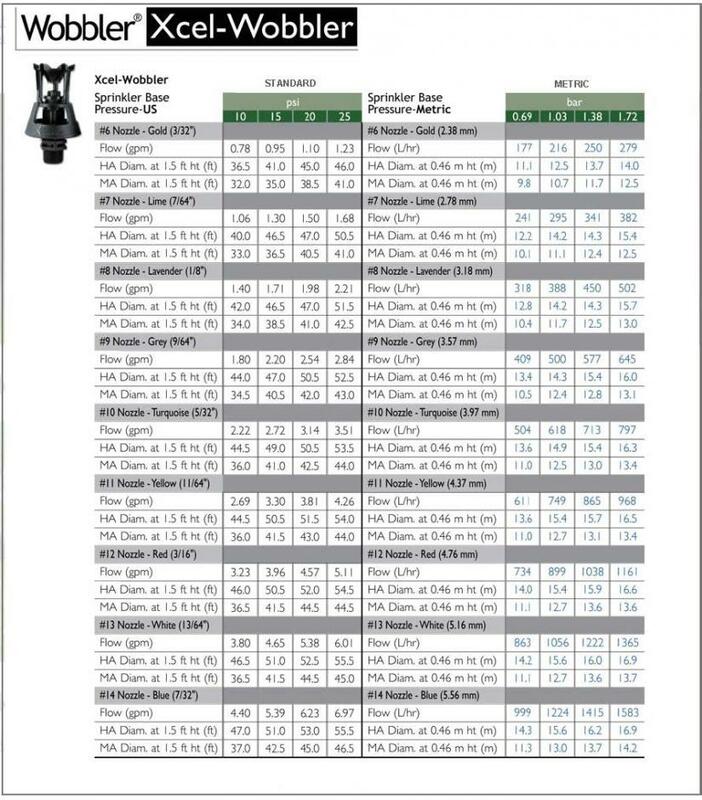 See specifications tab for full nozzle performance chart. We understand the frustration of returning to the local big box store to buy a cheap sprinkler each spring and we want to do something about it. 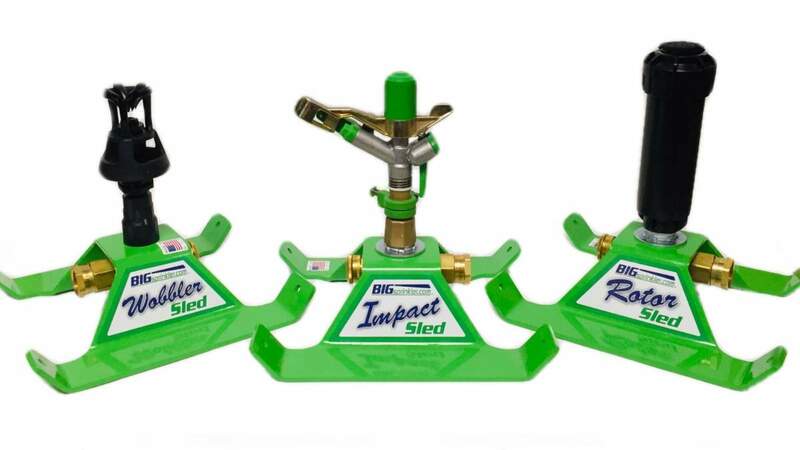 When we looked at our residential Sled Base Sprinklers and realized we could create a longer-lasting product with steel instead of the lighter plastic, sled base sprinklers, we sprang into action. Learn more about what we’ve done to upgrade our residential sprinklers. Each of the new products is special in its own way. Check out the list below to learn more their unique features. It’s not enough for the materials to be tough, we take an extra step by protecting those tough materials the best way we know how. Each of the three new sprinklers is offered with your choice of a powder-coated base or one using our new galvanized process. To galvanize it, the sled has been submerged in molten zinc alloys to form a non-corrosive, scratch- and rust-resistant barrier between the steel and the wet environment it will be operating in. This ensures years of trouble-free use. Before you add the sprinkler to your cart, simply use the drop-down to choose which coating you’d prefer. Helping you take care of your lawn, garden, or farm, or even just keeping dust at bay, is a serious business for us. We know how important quality sprinklers are to your success in doing what you love. We’re excited to be able to offer top-quality options and we’re always here to answer questions if you get stuck. Contact us today for more information about any of our products and we’ll help you create the irrigation system of your dreams.